Like most people I did a tiny bit of running at school. I remember “cross country” which was nothing of the sort. It was a few laps of a bland field. But I recall enjoying it. And then there was sports day. I could never really sprint (I’m sure many of you will have noticed I don’t really have this in my toolkit to this day) so I simply selected the longest thing on the menu. This was the 3000, run on a track painted on a grass field. I regularly hit the podium on this one. It is important to point out that more than three participants was a rarity. I seemed to do OK at weird sports really. I remember discus as a high point. I was OK at triple jump. 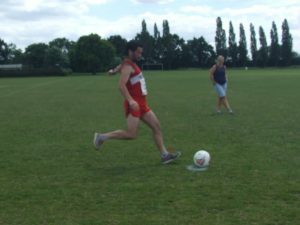 And I turned out to play rugby a bit, mainly because it seemed like a fight, legitimised. I guess my real breakthrough into competitive sport came when I was invited to try the little known, hidden, mad, bad and dangerous world of Cycle Speedway courtesy of my brother-in-law Dave Solomon. Now, this, I found, was really rather exciting. It seemed to consist of a lengthy drive, perhaps to Norwich, or the south coast, or even Oxford, for approximately four minutes of participation (perhaps five heats, each around 45 seconds in duration). But those four minutes of heady, blood and thunder, sprint-cycling action could certainly prove addictive. I did OK at it too, probably my greatest achievement being the U15 Suffolk title. I’ll always remember being tied on points in the lead and the title going to a “run off”. Basically, a two horse race with the winner taking all. I lost the toss, so got the outside gate. I couldn’t have cared less, we were at the Kesgrave track, a real high speed bowl of a thing, where the outside gates give you a beautiful fast line into the first bend. I just needed to get away like a demon, get around the outside of my opponent, and hold the lead. If “back yourself” had been invented back then it’s what I’d have been saying to myself. And I did it. How proud I was to have excelled locally at a weird sport that nobody had heard of. I had another “run-off” some time later to secure the last slot in the U15 British final, held that year in Leicester. We had riders in other categories on the day, so our club (Great Blakenham CSC) arranged a coach for a big day out. If I’m honest, I couldn’t believe I was in a British final, it seemed ludicrous. And it was. I was nowhere near the required standard and came convincingly last. The fact I’d scraped in was very evident. But. I made the final. I had a great day out rubbing shoulders with superstars. Put it this way, that year when Eddie The Eagle was a ski jumping sensation for all the wrong reasons, can you remember who won? Exactly. 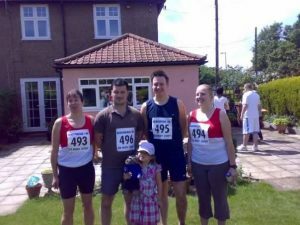 None of this tells you how I got into running, but it’s an insight into my early competitive experiences. This stuff shaped me, I’m sure. We, therefore, move on to adulthood. I didn’t do much for a few years. The odd bike ride here and there, but no real sport. 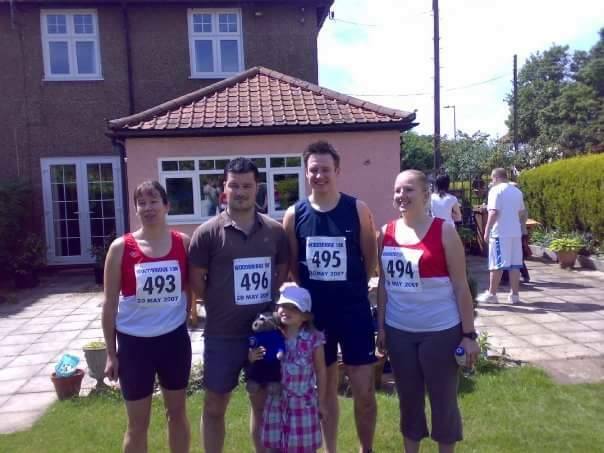 Then, one day in late 2006 my girlfriend at the time (a lady known as Joanne, she is now my wife) announced that she, along with her mother and brother, were going to enter something called the Woodbridge 10K, to be held the following May (2007). I didn’t really get it. They posted their forms and cheques off (yes, really!) and started mincing around the local streets doing “training”. At some point in about February, with this race looming something snapped inside me. I announced that I too, would complete this race. I also announced that I would defeat them all, with half the time to train. And off I went to JJB sports. I found a beautiful pair of silver New Balance trainers for about twenty five quid, but at this point chose to eschew other equipment. What could possibly be wrong with my brown Nike polo shirt and swimming trunks? (This is, absolutely, not a joke). Off I went then. I found a three mile loop near Joanne’s house and started to regularly run it. I found running for about five minutes and walking for one was good. It was hard. I looked forward to the walks if I’m honest. But my word it was rewarding. After a few weeks I was cruising for three miles, no walking needed. I could sense the stress in “team prepared”. They knew the idiot in the swimming trunks was becoming a threat. I revelled in the notoriety if I’m honest. I realised a powerful marker in this journey to the startline would be a “race distance” run. I developed a route on nice country lanes near home and just went for it one morning before a late shift. It was good. I didn’t have to stop, I felt pretty strong. It was at this point that I knew “team prepared” were actually now the underdogs. I was on fire. As an aside, this particular training route was exciting in an unexpected way. I recall cycling it when I was about nine or ten, just old enough to head out on the highway alone. This run, as a 31 year old man, evoked much the same excitement. The sights and smells and freedom being much the same. 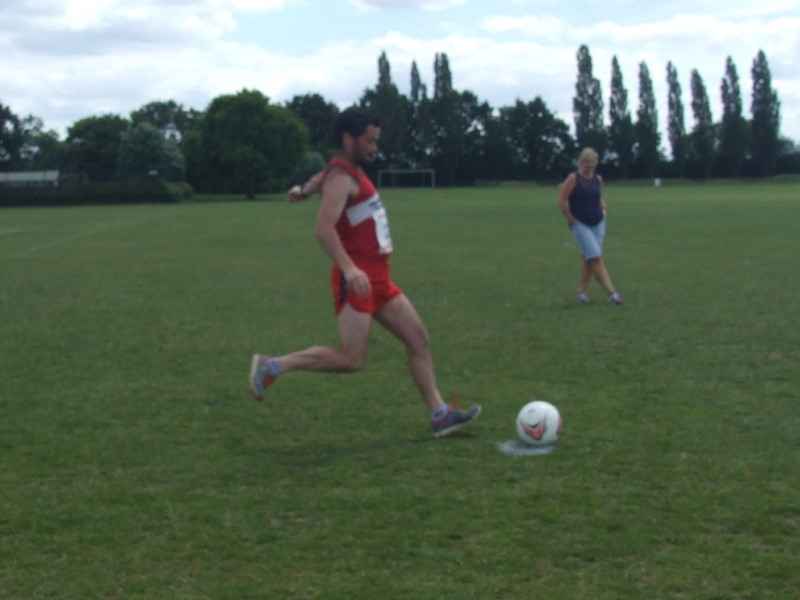 “I’m a distance runner” I thought! On to race day then. I got up feeling confident and donned my now familiar brown polo/trunks combo. We parked at a distant relative’s house on Burkitt road, right near the start. Race HQ wasn’t even a thing in our world, they’d posted the numbers out(!) I remember little about the actual race except my (now) father-in-law shouting at me that my (now) brother-in-law was just up the road and if I cracked on I would catch him. I finished, having not caught him, in 55:28. I was crestfallen, right up until I realised it was a windup. I was the winner by a massive five minutes. Andy (B-I-L) posted just over the hour, the future wife / (M-I-L) about five minutes later still. I was the champion. It was never in doubt. I remember, literally, strutting around the market square like Rocky Balboa, mission accomplished. But there was something else in my head. And it was simply this. “This cannot be the end. I want more of this”. Obviously we’re now well into 2017 and some of my plans have already been executed. At the outset, I tasked myself with a sub-85 half marathon, a sub 3:10 marathon and a 20 mile PB. So far I’ve fallen short with the half with three attempts so far. I did 86 at Great Bentley, a very aggressive wind ended my Stowmarket dreams and reduced me to an 88 (not in any way disappointing in those conditions) and I had a rude awakening at Bungay with another 88. I found the iconic Bungay-Beccles loop rather debilitating at half marathon pace! The 20 miler worried me. I considered my 2016 Tarpley 20 a high water mark in my career. You know the kind of race. You’re unburstable. You’re loving it. I pretty much accepted that I’d never top it, it was my first sub-2:20. I’d actually run TWENTY miles in the sixes. I felt ragged and on the edge this year, from the gun. I so wanted to PB again. To find some more somehow. And I bloody did. Twelve whole seconds! I ran 20 miles at 6:57 pace. It means nothing to so many, this is a personal sport, but my word I was proud of that one! And so, onto the big one, the marathon! As I write I’m one day out from this year’s attempt, but I’ll rewind you to the start of my marathon career to provide context. I remember Dave Solomon encouraging me to enter a marathon in 2012. “You’re nobody until you’ve done it my boy” or something like that. So I did. I entered Bungay. I trained and turned up, and loved it. First marathon, 3:27. This is an absolute doddle I thought. Onto 2013. A very cold, snowy winter, training was a challenge, but not impossible. Then, of course race day was twenty degrees. It was like a warzone. People were failing everywhere. I thought I could run 3:15, because marathons were easy. I did the first lap in 1:37. Brilliant. Except it wasn’t. Because as I was greeting my supporters at this halfway point I already knew I’d blown it. And so I embarked on the second lap from hell. I was rewarded with (still) my slowest marathon to date, a 3:38. I realise this isn’t a disgrace, but it was a long way short of what I attempted! I learned a lot that day. 2014. Back to Bungay. Had a bit of illness in the run up, felt awful on race day. Ground out a small PB with a 3:25. 2015. Back to Bungay. Had a bit of illness in the run up, felt OK on race day, big new PB with a pleasing 3:18. 2016. Back to Bungay. Felt good. Massive elephant in the room. I’m 40 years old. A three minute PB will achieve the unthinkable: Good-For-Age. 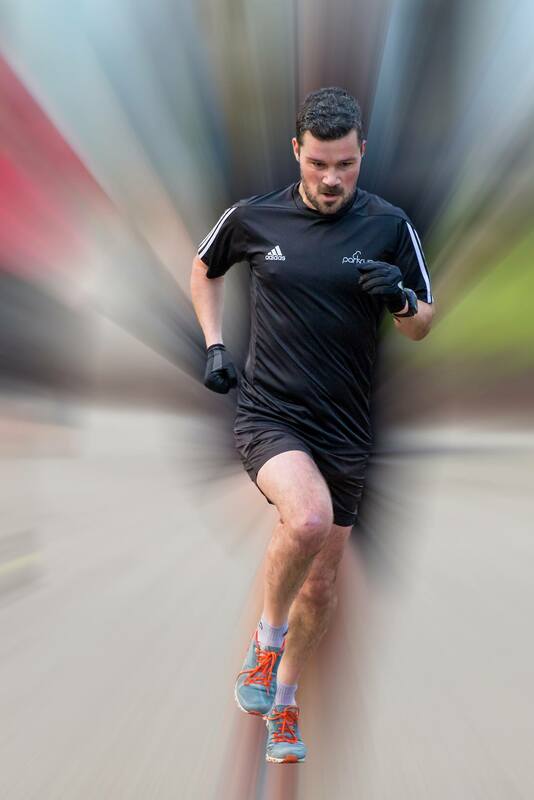 Could the 2017 London Marathon accept me? Really? It was a good race. In fact, it was right out of the top drawer. I was immediately at ease on the startline as a friend with very similar intentions/abilities appeared. I didn’t know he was entered in the race. I was pleased to have performance oriented company. Off we went, chatting and putting the world to rights. The miles passed easily. Well into the second lap we were seemingly cruising at quite low sevens. I know this course always comes up at 26.4 so based my plan on that. At 25.4 I was at about 3:04. I needed 3:15. I’d bloody done it. I crossed the line in 3:12:18. It was magnificent. But I couldn’t totally drink it in. Not yet. You see, another friend of mine from The Saxons was desperately chasing GFA. We’d lost him on lap two when he stopped for a wee. Somehow, the day was going to be spoiled if this fine man didn’t get in too. I waited with baited breath and was elated to see a familiar figure stride around the final corner to finish in a low 3:14. Finally, we could all cut loose and celebrate together. It couldn’t be any better. Except it could, because I was then issued with the MV40 Suffolk marathon title. I couldn’t believe it. What a day. And so the cycle of brilliance followed immediately by a hearty slap around the chops for being a massive fool continues. Actual plans, from this moment on, centre around a massive assault on the Woodbridge 10K. This year will be my 11th consecutive appearance, and it will always be my favourite, and such a special day out. This year’s edition is doubly significant because Joanne is racing again, ten years on from where it all began. And all of a sudden, the tiny child is 15 and is also in! The whole family will be leaving home on that Sunday in May to become heroes in the Market Square. I can’t wait. Then, of course, there is the Friday 5 series. Early in my FRR career I learned of the legend of Tim Finegan. I remember the special T-shirt that he was presented with after 60 consecutive races (12 years!) It’s sad that this fine man is now finding running difficult, and I recall 2016 as the year that he bowed out. I loved the encouragement that he shouted to me from his marshall point on that year’s Kirton 5. It was almost (in my mind, at least) the handing over of the baton. I’ve done eight years now, no races missed. I believe Tim achieved fourteen in the end.I have a way to go, but I’d love to take this title, and of course, I would dedicate it to Tim, for inspiring me in this madness. Later in the year I’m tremendously excited about the new-for-2017 Great East Run. This is a huge event in my home town and I’m sure it will be a fantastic thing to be part of. Whisper it, but after my London Marathon debut I might just have developed a taste for “big” events! One other big thing is looming in my running world for 2017. Many will know of my unswerving passion for parkrun. I can’t stress enough what a phenomenal thing it is, has been, and will continue to be in my life. I went to the first one in Ipswich, unsure about it. I didn’t really know what it was, or who it was aimed at. I attended to find out. 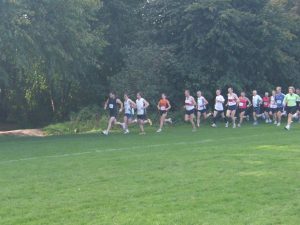 I met lots of friendly people, and within half a mile of the start was running along fantastic, scenic, interesting paths through a genuinely amazing park that I don’t think I’d ever visited, despite being an Ipswich resident for the vast majority of my life. The sights and smells from that crisp, sunny September morning had a profound effect on me. I couldn’t believe what a brilliant run it was. No baggage, no numbers, no nonsense. I knew I’d found something that I’d be part of in the future. And I have been. As I write I’ve completed 240 parkruns and look forward to being the first local parkrunner to receive the hallowed 250 shirt in a few short weeks. And this, let me tell you, will be up there with the 2017 London Marathon finisher’s shirt! I feared this question because I pretty much like them all. I’ll try to maintain some sense of order by selecting a few that stand out for me, for various reasons. See above. I’ve a decade of unswerving attendance at this one, it’s where it all began for me, and every year I’m amazed all over again how one small town can morph into such a gladiatorial cauldron of athletic tension. I’ve experienced many of my greatest running highs on that market square. This is my sort of course. Fast with some sustainable undulation. I’ve never really had a bad run here. I recall my first ever serious attempt at a sub-90 at Great Bentley in 2012. I ran well. But not well enough. I crossed the line in 1:30:02. Never has a huge PB felt so disastrous! Fortunately, Stowmarket was the very next week. I forget the exact nature of the Solomon catastrophe at the time, but he wasn’t at full bore and decided to pace me. And it worked. I achieved 1:29:52. Just ten seconds, but I felt ten feet tall. And the race has been kind to me ever since. It’s my current PB (1:25) and I believe it’ll be the scene of my 1:24 if it ever happens. It’s a classic, and I haven’t even mentioned the lawnmowers! This is a 2pm start, on a Wednesday afternoon in the Autumn. That is quite enough to give it a bit of “Hahaha, I’m bunking off” magic. 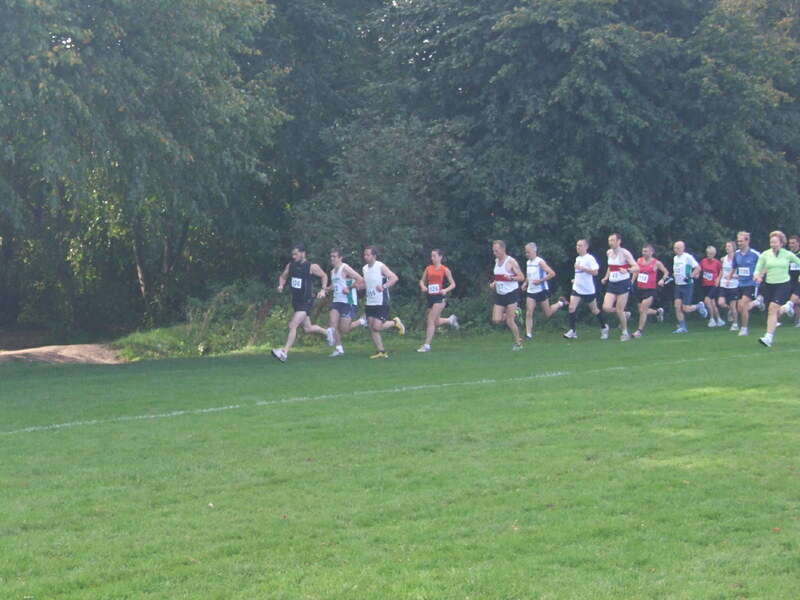 But it’s also a fantastic, fast course, and a friendly, superbly organised event. Well worth a day’s holiday from work. Simply the king of local 20s (although there’s not a bad one, they’re all excellent) mainly because it’s one lap. You feel like you’ve travelled! Arguably the fastest course at this distance too (it certainly is for me). I think it’s all been said! But it’s interesting how this has become such a huge deal for FRR these days. Admit it, you all love it really. And I’m not even on commission sadly. And yes, I’m going to put it in. I didn’t know if it would be “for me”. But it really was. I have nothing negative to say about this one (apart from my own slightly deranged performance). The London Marathon! It looks like the Good-For-Age rules are unchanged so I get another go in 2018. I’m already excited. You know what? There’s loads more. So I must offer my apologies to, in no particular order, Fram 10K, Twilight 10K, Capel 5, Saxmundham 5, Turkey Trot, Coastal 10, RHS 5K (mainly for being 6K and having mulled wine), The Golden Mile, Scenic 7, Newmarket 10K, Martlesham 10K, Heritage Coast, etc etc etc. You all deserved a write up. Really you did. I just enjoy a race, they’re all magnificent. Another very difficult question purely because I have such a rich catalogue to select from. But there’s a few that stand out conspicuously. I always hit the startline of this one in bullish mood, believing that magic will happen for me, because it so often has. And it really did on this day. I recall little of the race itself, apart from two things. One was the very, very high pace on my watch, and the utter joy that I was holding it, and two was the fact that I was on Solomon’s shoulder for vast swathes of time. He couldn’t shake me off. I knew he’d do me in the last half mile or so. He’s a much stronger finisher than I am (so is everyone really) but I enjoyed my time in this rarified peloton. In truth, I’d have been uncomfortable defeating him. It’d be like vandalising a listed building. But what a day. It remains my PB, it was 38:31@6:11 average. 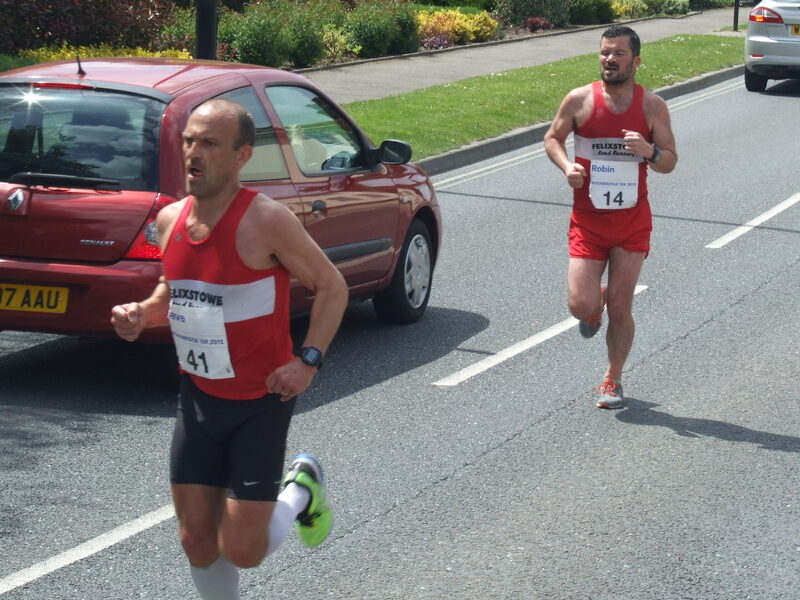 Ipswich 5K Series, Year One, Race One (May 2013). I got wind of this one and almost boiled over with excitement. I’d loved the course after the first ever parkrun winter relocation. I couldn’t wait for a “real” race on it! I turned up early. “Not many here” I thought to myself. And yes, it was sparse. But when the gun went, I found myself in an assertive scrap for THE LEAD! I didn’t know the opposition (I do now, Chris, from Ipswich Tri Club. Top bloke). Towards the end of lap two, I broke him. I remember looking over my shoulder on the final climb into the finish to see that I had probably fifty metres. I’d done it. I’d won! I won a race! And as this was the first ever race in the first ever series, I (briefly) held the course record! What an evening. My wife (prior to being it) found this one, via a windscreen flyer I think. A new race, billed as a great XC sharpener with its multi-terrain vibe. We were both part of the 28 athletes that attended this inaugural staging. We loved it. But the “favourite moment” for me is how this race has captured the imagination of our wonderful club. I recall a couple of years ago diligently completing the startline warmup routine. I caught a glimpse of, I think, Jo Whelan. We were both laughing our heads off. And that, there, is what it’s all about. This is a great, great race, but it’s also seriously good fun, with a capital F. I’ve never missed a Saxon 5. And it’s a favourite moment. Every year. Even when it rains. I feel honoured to be the man that gets to plot the club’s assault on this one. It’s a “favourite moment” every year. From the spreadsheet, to the traditional cycle ride over with JJ, via the unexpected extra 10K because somebody has been arrested on the way (or something), right up to the post race beer and sandwiches, this day is right out of the top drawer. On the subject of which, it’s now May, must stock up on Tippex. parkrun (any Saturday, I’m not fussy). You know I’m a fan. Most of you are too, and we’re working on Glanfield. It still excites me every week, nearly five years on. The concept is incredible, and there’s simply no negatives. Whenever I’m on holiday I find the local one and it’s exactly the same. The characters, the pretending it’s not a race whilst absolutely massacring yourself, the post-run tea. It’s the only place I’ve ever found myself dog-sitting for someone I’ve known five minutes. The dog owner’s thought process was simply “He’s a parkrunner, he must be alright”. It’s a weekly favourite moment. The race is always good. But forget that. 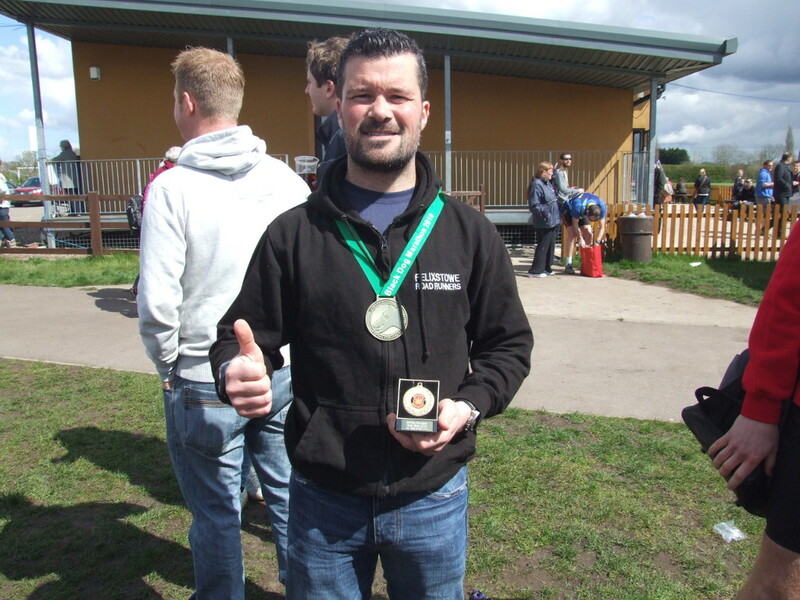 I was THE ONLY GROWN UP to score in the charity penalty shootout competition afterwards. Just dwell on that for a moment. What an achievement. I guess, to sum up, I would say that I never seem very far away from a “favourite moment” because I’m an FRR. When you head out in the iconic red vest you’re always close to a great event, or a team mate to be inspired by.